Breathtaking views, good food and museums. This is Stockholm at its best, if My Josefsson and Joakim Roti get to decide. As 26-year-old motorhome lovers, they draw a certain amount of attention at campsites, but they have already been bitten by the camping bug. A motorhome offers a sort of freedom that is hard to beat. The sun is shining on Saturday morning at Långholmens Husbilscamping despite the threatening grey clouds above Västerbro Bridge. My optimistically sets the breakfast table outside under the awning while Joakim fills the water tank in the motorhome. “This is what I always look forward to – eating breakfast outside. It’s fantastic,” says My as they sit down and help themselves to coffee, juice, freshly baked bread, grapes and glazed doughnuts. 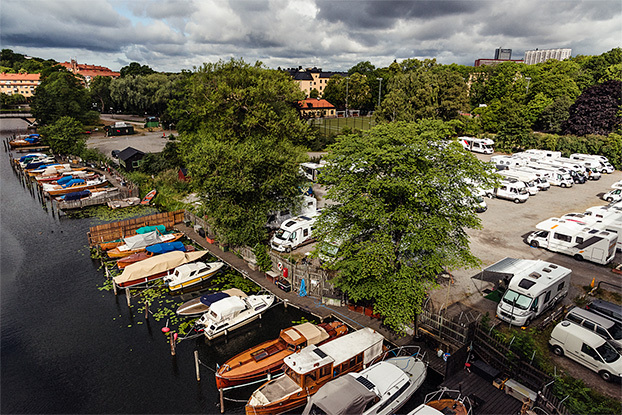 This motorhome campsite on Långholmen is beautifully framed by the district of Hornstull, swimming beaches and a wooden-boat harbour. Camping guests of different nationalities walk around in their slippers between the cars and service buildings. With a small café, a store and service areas, My and Joakim think that the campsite is perfectly equipped. “This is perfect, well worth the money!” says My. They have visited family and friends in Stockholm many times, but this is the first time they have come in the motorhome – which means they will get to see the city from a brandnew perspective. “It’s time to really be a tourist,” smiles My. The first stop for the day is Långholmen Prison Museum, which is close to the campsite. Here, visitors can see everything from guillotines to ladders made out of prison sheets by prisoners. “This prisoner was caught at Långholmen Bridge, it says here,” reads Joakim about the ladder. “Too bad, I was just thinking that after going to all that effort it would be nice if he’d got away,” sighs My. Next on the schedule is a fantastic viewpoint, Monteliusgatan and Ivar Los Park high above Söder Mälarstrand. The city opens up there with a view of City Hall, the Old Town, Djurgården island and Gröna Lund amusement park to the north. A light drizzle has no effect on the couple’s enjoyment. “Look at the City Hall, it’s so beautiful. I’ve never seen it from this angle,” says My. “Look there – Eclipse!” cries Joakim and spins his hand to indicate the ride at Gröna Lund that is not for the faint of heart. As their stomachs start to rumble, they head to TGIF in Kungsträdgården. The park is full of children testing different sports activities. “We always come to Kungsträdgården when we’re in Stockholm. This is my idea of what a city is, and there’s always something going on here,” says Joakim. They have Joakim’s grandfather to thank for the motorhome. He bought a new motorhome several years before he stopped camping, and now Joakim’s family shares the motorhome. The couple has already been on an “absolutely fantastic” motorhome vacation to Italy, and they are now planning more trips abroad. “Friends our age were a little sceptical before we went on our first long road trip. They wondered if we were just going to sit in the motorhome doing crossword puzzles and drinking low-alcohol beer. But once we told them where we were going they almost wanted to come along and ended up helping us plan the trip,” says My, who adds that if she is to be honest she sometimes does actually sit in the motorhome doing a crossword puzzle. “A lot of younger people would probably really like spending their holiday in a motorhome if they knew how comfortable it was. The problem is maybe that everyone can’t afford to own their own motorhome and aren’t lucky like us and able to borrow one,” says Joakim. My is now doing her best to spread the word on Instagram about being a young motorhome-camper. The only problem the couple can see is that it at times can be a bit difficult to find new friends their own age. “But we like to sit and chat with, say, an older couple from Arvidsjaur as well,” says My, using local dialect that hints at her roots in Gothenburg. “And then we also like to spend time with one another,” she adds with a wide smile. after lunch, it is time to jump on the tram that will take them to ABBA The Museum. They go all-in for their visit and purchase the audio guide so they can walk through the exhibitions and listen to the ABBA members themselves tell the story behind one of Swedish music’s most successful exports. “Check it out, Jocke! There’s the guitar that they used when they won with Waterloo!” calls My. Later, they stroll contentedly towards the Djurgården island ferry. “I thought it was a good museum, just the right size and I learned lots that I didn’t know about ABBA,” says Joakim. 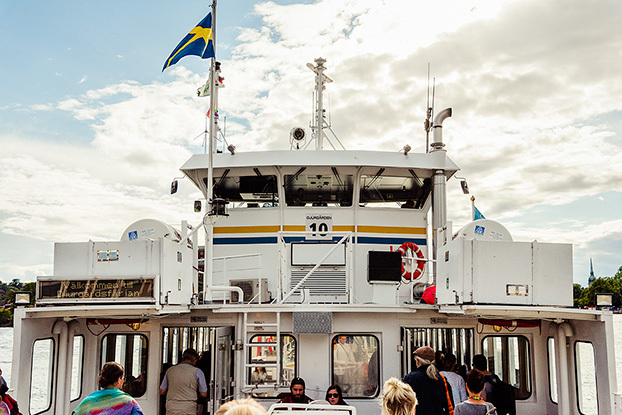 They step aboard the classic Djurgården island ferry, which putt-putts back toward their motorhome. It is time to change their clothes and get ready to go out for the evening. “Getting ready in the motorhome is no problem – we have electricity, a shower and mirrors,” says My. “Yes, I always look like this, it doesn’t matter if I stay at a hotel or in a motorhome,” says Joakim. They start the evening at the rooftop bar, Tak, up on Urban Escape in the middle of the city. We find ourselves in one of Stockholm’s newest neighbourhoods next to Brunkebergstorg. There are once again breathtaking views – but from a different angle. The evening sun is magical and there is no sign of the rain from earlier in the day. They continue on to Brasserie Balzac, where they are looking forward to ordering steak. This probably won’t be the last time they camp in an urban environment. “It’s fantastic to be able to bring your own accommodation and stay so close to everything,” says Joakim. Roundtrip on the ferry to Helsingör, Denmark, the Tropikeriet indoor zoo, Sofiero Palace, the Kärnan tower and shopping on Kullagatan. The campsite is called Nordic Camping Råå Vallar. The Liseberg amusement park, the Universeum science centre, the Botanical Garden and Slottsskogen Park. The campsite is called Lisebergsbyn. Bryggerikällaren for a gastronomical experience, Studio Acusticum for a concert, Pite Havsbad for a swim or Skjutbiografen for some shooting. The campsite is called Västra Kajen Camping & Gästhamn. with a view at Svampen, Örebro’s landmark. The campsite is called Gustavsvik.